But it shouldn't stop there. You should also be performing regular maintenance checks every time your website is updated, to keep things running smoothly. Firstly, come up with a testing plan. Have you researched your target audience - who is likely to be visiting your website most often? Which browsers will they be using, and what is the average connection speed of these users? Once you have gathered this information, you should bear this in mind when it comes to testing how your website is going to perform under these different variables. Testing doesn't have to be expensive. You can acquire the necessary testing tools relatively cheaply, or even for free, but do your research first and decide which testing tools will best suit your budget and needs. Saying that, most browsers are free, and you can also pick up emulators and 30-day free trials for most of the software you'll need. Bear in mind if you look around, you may find some website design discussion lists and forums which openly encourage testing requests and posts for bug reports and constructive feedback. Check those out to get a better idea of what others are doing. In order for a website to be testing effectively, protocols need to be set up to determine the standard you want to achieve. Take screenshots of how your website should look. Ideally you want it to look the same in all browsers, although sometimes this can be easier said than done. If you are having someone test for you, communicate to them the acceptable standard you are aiming for, but be sure to outline the differences (and there will be some) in standard across varying browsers that you are willing to accept. Prior to launching your site, you should always use a staging or test server which can emulate the conditions of your site when it goes live. Test one page at a time, and make sure you're happy with each one before moving on to the next. Simple advice, but you'd be wise to follow it. Keep a record of all bugs and fixes as you go - just in case. Regression testing, or verification testing, basically just means going back and retesting areas of your site just to make sure there is no breakdown in your code or the site's overall quality. This is general standard practice maintenance. Validate the mark-up for your individual pages. Each needs to use structural, compliant mark-up. Doing this will help you avoid any syntax errors or typos you may have made. You can use automated markup validators which are often available with HTML editors. Don't forget to validate your CSS! Test, test, test! Try out your website on as many browsers as humanly possible, and keep testing until you are confident that your website looks the best it can and is user-friendly and completely error-free. Otherwise all your hard work would be a waste. 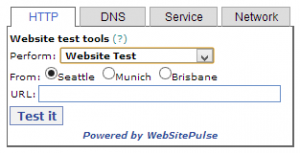 For great tools to test your website for free, visit WebSitePulse today!